Thanksgiving is more than a heavily laden table; it's a feeling of gratitude and appreciation that should spread through your entire home. When this autumn holiday rolls around this year, take a bit of time to decorate your home - both inside and out - to reflect the beauty and the spirit of thanks. Crackling fire, warm color, and natural materials are just a few of the joys of the autumn season. Combine all of those factors into one delightful DIY Thanksgiving centerpiece or mantel decoration with this easy log tea light candle holder. You'll find all the details at Jenna Burger Design. Don't limit this glorious Thanksgiving garland to your mantel; you can also wind it around your staircase banister, hang it over a curtain rod, or drape it around your buffet. Each paper leaf is attached with a clothes pin, making it simple for guests to remove a leaf, write what they are most thankful for, and then reattach the leaf to the garland. What a wonderful idea from Tatertots & Jello. Thanksgiving decor doesn't have to be excessive or elaborate. It can be as little as a small bunch of dried autumn-hued flowers in a vase, along with a couple of pumpkins whether faux or real. In this cottage-style living room, Fox Hollow Cottage shows how to add a touch of Thanksgiving without going overboard. If you want to liven up your Thanksgiving or autumn table without spending a bundle on florist flowers, create your own centerpiece with an interesting, tall glass vase, a handful of miniature pinecones, and a small bouquet of pretty fall flowers, whether faux or real. Take some inspiration from the centerpiece shown here from Sweet Something Designs. After dinner, your guests will undoubtedly sit and chat in the living room, so take advantage of the fireplace mantel to spell out the heart of the holiday. This lovely room is from The Lily Pad Cottage. If you live in a mild-winter area, you might be able to enjoy Thanksgiving dinner outdoors. If so, take a tip or two from this glorious tabletop found on Southern Living, and center your table around gorgeous floral bouquets arranged in pumpkins. Stunning. If you're looking to do something special with ordinary pumpkins, why not give this fun project from Les Petites Gourmettes a try? Instead of orange, give Burberry plaid a whirl. You'll find the complete directions here. 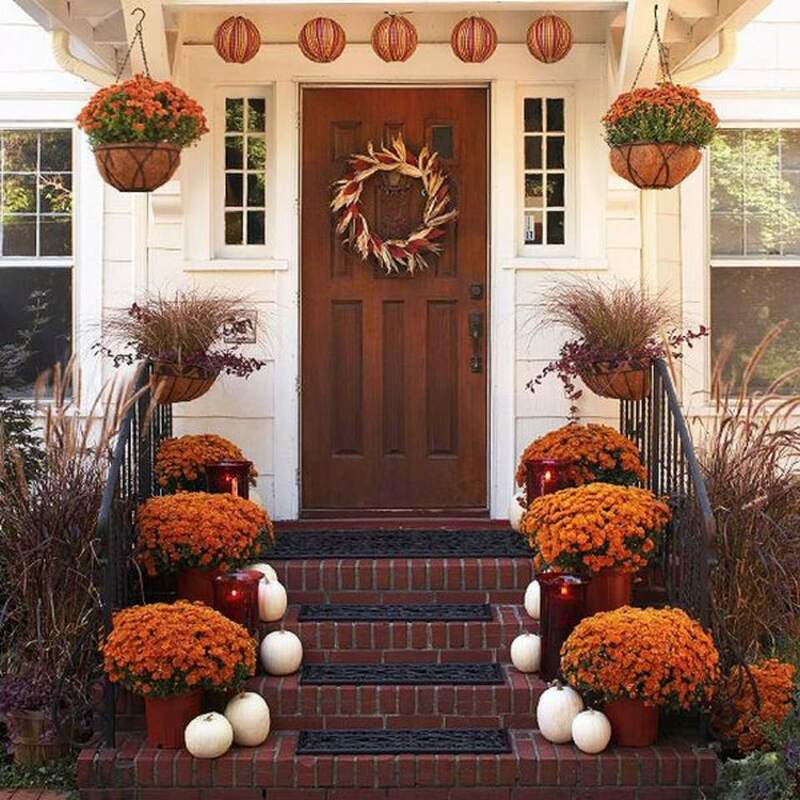 Show guests how welcome they are with a front entryway filled with potted plants, pumpkins, gourds, corn shucks, and bright ribbons. This colorful doorway is from Hadley Court. Don't leave your home's foyer out of the Thanksgiving festivities. After all, it's the first space your guests will see. Here, the banisters are wrapped in a harvest garland, while glowing faux pumpkins and fall leaves liven up the entry. For an easy autumn or Thanksgiving display on your coffee table, dresser, dining table, or end table, why not fill a shallow wooden bowl or basket with burlap ribbon, mini pumpkins, faux fall leaves, and painted Mason jars holding electric tea lights? So easy and so pretty. The display shown here is from DIYspins. If you're lucky enough to have an enclosed patio room, like this one from Four Generations One Roof, don't forget to give it the Thanksgiving touch. Faux pumpkins, fall leaves, and an inspirational saying are all it takes to give a space the holiday vibe. 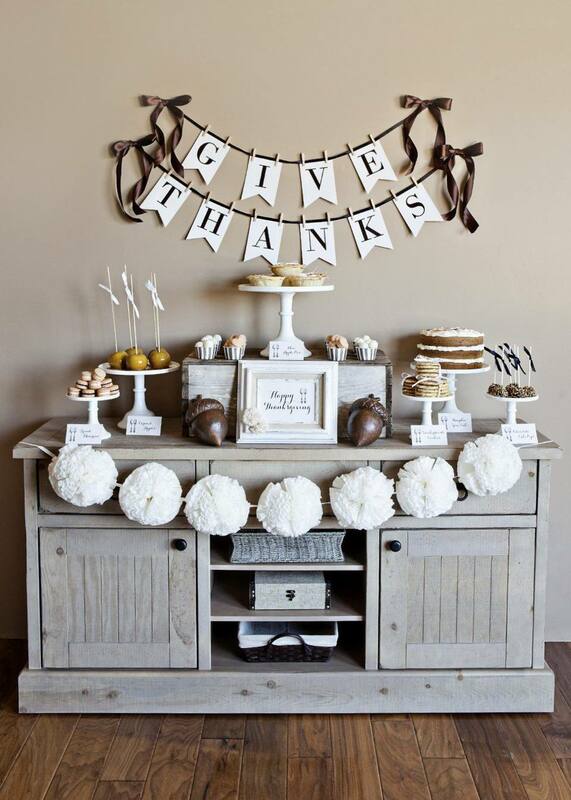 Remind your guests to count their blessings as they help themselves to your delicious desserts with a pretty banner. You'll find the free printables for the banner, Thanksgiving sign, and dish labels at The Tomkat Studio. In many areas, Thanksgiving means cold weather and little to no flowers or greenery growing in your garden or outdoor containers. If that's the case where you live, add some life and color to otherwise barren pots by filling them with a display of pumpkins, gourds, ornamental kale, and interesting twigs, as in the display from A Pretty Life shown here. Pumpkins might be traditional Thanksgiving motifs, but there's no rule saying they have to be orange. Instead, show off a gathering of heirloom gray and white pumpkins, like this lovely holiday table from Liz Marie Blog. Add in some hydrangea blossoms for the crowning touch. Looking for an easy, inexpensive, yet lovely decoration for your mantel, dining table, coffee table, or foyer console? Then consider this idea from Thrive. Scrape the labels off a set of matching bottles - beer, soda, wine, or water are all fine - add self-stick vinyl letters to spell out your phrase or word of choice, then add a bouquet of wheat to top it all off. Modern Day Moms has another easy, inexpensive, and lovely way to decorate your Thanksgiving mantel, dining table, foyer console, or even a bathroom counter. All you'll need are basics from the dollar store: glass votives, paint pens, tea light candles, and small pebbles, shells, faux moss, or similar natural elements. You'll find complete directions here. If your front patio is protected from the elements, like this one from Our Southern Home, you can decorate with furniture normally only found inside the house. Go ahead and show off a lavish harvest display with garlands, pumpkins, and gourds. Think you have to pay top dollar to a professional florist for gorgeous bouquets? Then check out this supermarket bouquet in a simple glass vase from DIY Network. Just choose a bouquet with seasonal beauties outside the usual mums, and arrange to your liking. Use the money you save to splurge on desserts. Cornucopias are a traditional Thanksgiving motif, so go ahead and grace your table with this symbol of harvest plenty. This beauty, found on Hadley Court, shows off gourds, berries, and leaves, instead of the usual fruit and nuts. Here's another super easy way to decorate your Thanksgiving or harvest dining table, coffee table, front entrance, or even the bathroom counter. Just fill up a glass bowl with a selection of mini pumpkins and other colorful small gourds, like this beautiful display from Dandelion Moms. "Wow" is the word that comes to mind upon seeing this gorgeous table display from Confessions of a Plate Addict. What a stunning collection of heirloom pumpkins and other gourds. Wreaths aren't just for Christmas; they are a beautiful way to welcome any holiday, or just add a touch of color to your entryway. Here, an inexpensive DIY wreath reminds guests to give thanks. You'll find the complete directions at Tidbits & Twine. Start a new Thanksgiving tradition with a gratitude tree. The idea is simple; guests write a few words describing what they are thankful for on the small slips of paper you provide, then hang them on the twig "tree." You can read more about this lovely idea at Jones Design Company. The Endearing Home shows off an elegant, yet simple Thanksgiving tablescape. White and orange pumpkins, pinecones, and wheat bring natural grace to the scene. So lovely.